From Bradford, U.K. comes the initial introduction to SON OF BOAR, the three-song ‘A Tongueless Tale’ EP, released a little over one month ago. Truth is, both it and the band have quite a lot in common with the municipal borough that SON OF BOAR call their home. Bradford was one of the earliest locations for the boom of the Industrial Revolution in the 19th century, becoming known for its textile manufacturing and access to natural resources like coal and iron ore. The music of SON OF BOAR – Luke Oliver (vocals), Adam Waddell (guitar), Lyndon Birchall (guitar), Luke Doran (drums), and Gareth Bates (bass) – shares traits and characteristics one could associate with this. Much like textile production, the band mingles and interweaves sinewy fibers of southern sludge, psych-doom, and stoner metal into a resilient construct. They do so with a seemingly blue-collar or hands-on work ethic, no doubt derived from the guys’ time spent in other bands like Lizard Tongue, Old School Enemy, Varro 9, Skulls, 40 Thieves, and others. Now as SON OF BOAR, this five piece lumber forth and linger amid the grooves of the deep, molasses-y riffs of opening cut “Broken Chains“. Slow and bluesy, a plodding path forward is unfurled with a Down-esque guitar sound and a bit of a bemoaning, burly vocal styling – yet things gradually accelerate into some rather sweltering jamming. “Outlet“, the second track, is a whole other animal, with an enticing, heavy-handed take on desert rock type music and solidly supplied vocals. The rhythm section really keep things on point, with the drumming of Doran becoming an impressive component to it all, along with smoking guitar solos mid-way through. There is also Oliver’s gravelly, over-the-top vocals providing an intriguing lyrical narration that seems like a cautionary tale of sorts. Third and lastly is the title track of this record, “A Tongueless Tale“, begun by a bit of subdued, isolated bass lines. Other instruments soon find their way into the mix, albeit still slightly downplayed, thus giving things a heady feel ala Clutch’s “Space Grass“. With a palpable pressure building, tension is felt backing up… it needs to be released and it soon does, in a tempest of instruments and aggression-laden vocals. This patterning repeats itself and again, each member’s playing sews a wicked stitch into an ominous quilt of sonic chaos. 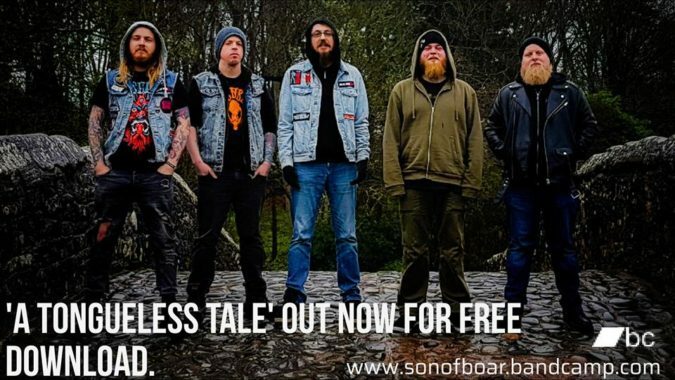 SON OF BOAR strike a fatal wound with their ‘A Tongueless Tale’ EP, much like some of the characters within the folktale associated with the band’s home place, “The Legend Of The Bradford Boar“. It is an interesting factor for sure. If you would like to know more about the story, read THIS. You can stream the EP in this review or go over to Bandcamp where it is streaming and currently available as an NYP (Name Your Price) digital download.